How do I masquerade as a user in my account? Account admins can masquerade as (become) any learner in their account, which is essentially logging in as the learner without a password. You will be able to take any action as if you were the learner. However, the actions you perform on behalf of the learner are catalogued. 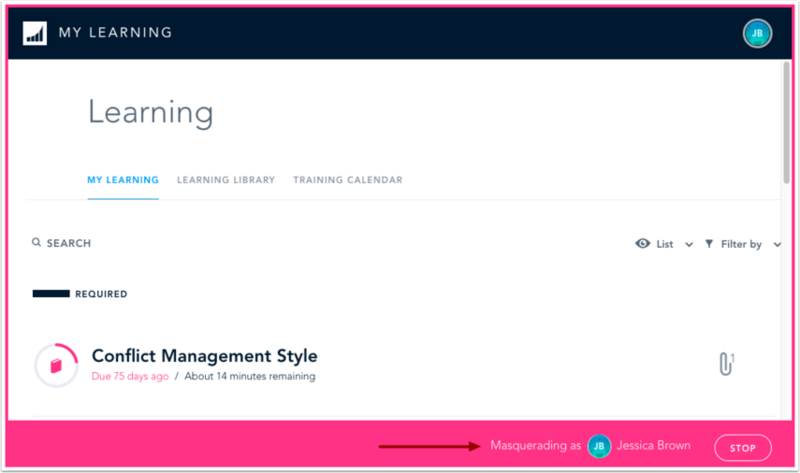 Account admins can masquerade as a learner from the Users page or from the Dashboard page. In the Users and Permissions menu , click the Masquerade link . Type the name of the user and click the Become button. The bar at the bottom of your browser window indicates you have become the user. To stop masquerading as the user, click the Stop button. Previous Topic:How do I assign or modify user roles in my account? Next Topic:How do I send a message to all learners in Bridge? Table of Contents > Manage Users > How do I masquerade as a user in my account? How do I use the Insights Page? How do I assign or modify user roles in my account?